IPS students testing their bridges. Some great bridges are being destroyed! This year’s freshman science class at Haverford High School looks nothing like years past. Inquiry into the Physical Setting students are now immersed in a hands-on engineering design course focused on cooperative learning to give students the 21st-century skills needed to succeed in today’s workforce. Starting with a mousetrap car project, students learn the ins and outs of the design-test-redesign model that they will be expected to implement in future projects moving forward. Instead of a traditional “egg drop” activity, these students designed a restraint system to keep a passenger (raw egg) in a small car with a bumper system to reduce injuries on the passenger all while staying within a budget. In addition, each student recorded a “sales pitch” to an executive of a car company highlighting why their design is worthy of investment. Building on their TinkerCad skills from middle school, the class designed, sketched, and constructed balsa wood bridges of all shapes and styles designed to span a 40-centimeter gap. The efficiency of each bridge was tested by hanging mass from the center until they broke. While most of the students constructed more traditional truss style bridges, several went with more creative designs like suspension and arch bridges. 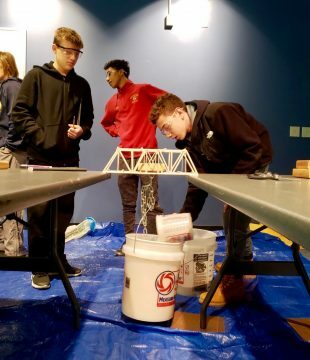 Even though these bridges are known to be less efficient than others, these students were given the freedom, time, and room to fail and redesign to let their creativity lead the way to produce outside-the-box solutions. Each project was completed in heterogeneous groups of two, three, or four. This offered students the opportunity to improve skills such as working cooperatively, communicating effectively and making compromises in order to complete a given task. The goal of the new curriculum is to give the students some background knowledge then let them lead the way in their learning. With a focus on the design-test-redesign process, we hope our students’ creativity will shine.